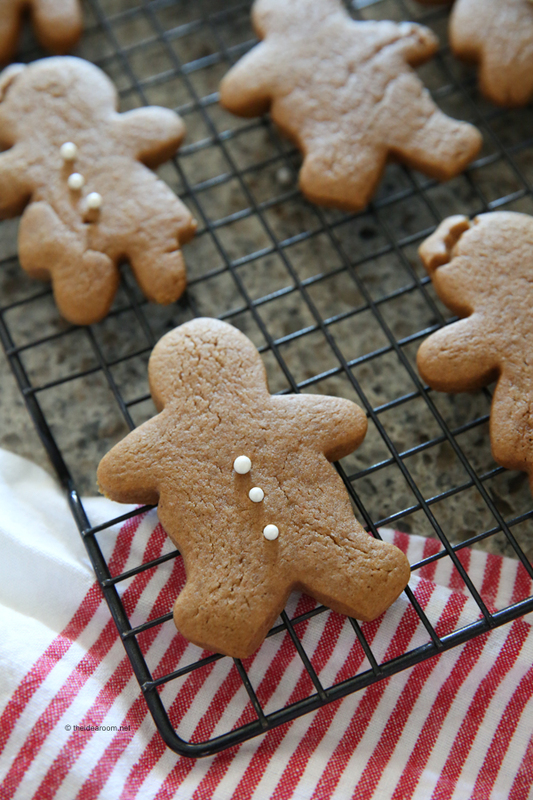 These soft gingerbread cookies are sweet, soft, and lightly spiced. This is the perfect cut-out cookie recipe that won’t lose its shape when it bakes. Try our gingerbread cookie recipe this holiday season! 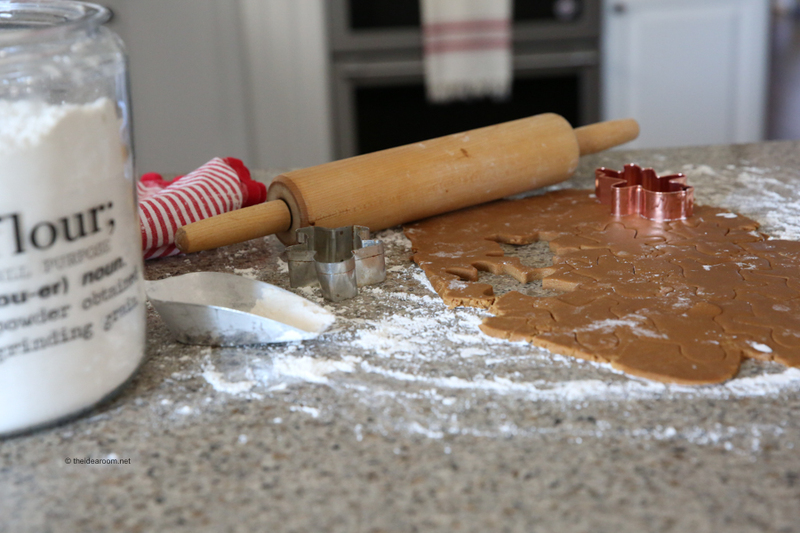 One of our favorite holiday traditions is holiday baking! I grew up baking during the holidays in my home with my mom and grandmother, so it is something that I have tried to continue in my own home. We have several recipes that we make only during the holidays to keep them extra special and something we look forward to enjoying together! Do you enjoy baking or cooking during the holidays? 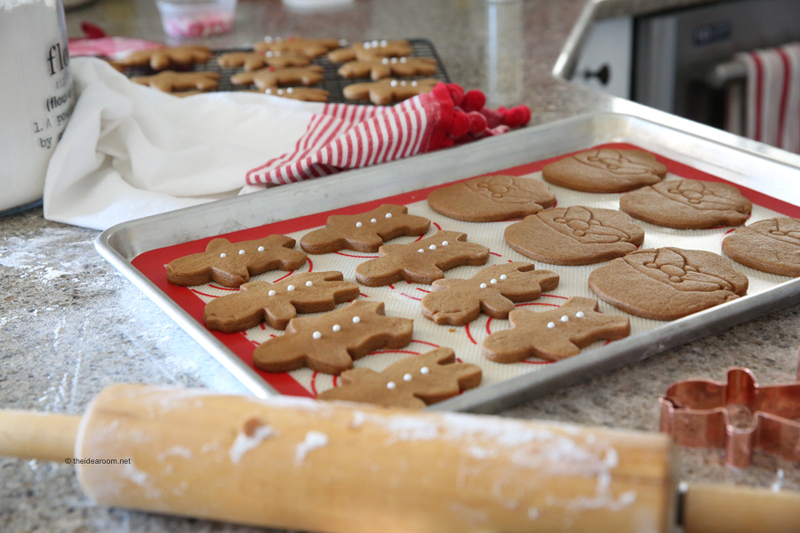 One of the kids favorite recipes to make is our soft gingerbread cookies recipe! We almost always cut them into gingerbread boys and girls and sometimes a Santa or a Christmas tree. You can also make gingerbread houses out of this cookie dough! 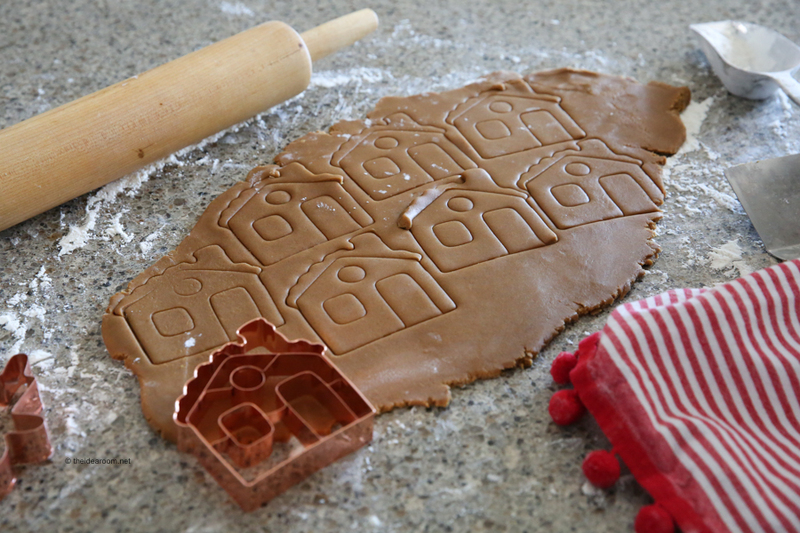 I have linked to some gingerbread house cookie cutters at the bottom of this post! 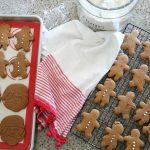 For some reason these soft gingerbread cookies recipe tastes better when we cut the dough into gingerbread man cookies (or gingerbread girl cookies too)! My kids have always enjoyed eating gingerbread man cookies and insist that we always leave them for Santa Claus on Christmas Eve. So when we make them, we just make sure to pop a couple into the freezer and save them so we can pull them out on Christmas Eve. This way I don’t have to scramble to find some cookies to leave out for Santa Clause. To make gingerbread dough easier to work with, chill the dough for at least 1 hour before rolling it out. This will also help it to keep its shape while baking. Roll out the dough on a surface that’s lightly dusted with flour or a mixture of flour and confectioners’ sugar. If the dough isn’t too sticky, you can roll it out between sheets of parchment paper if that is easier for you. Keep cookie cutters from sticking to the dough by misting them very lightly with cooking spray or dipping the edges into flour. If you’re cutting out large or intricate shapes, here’s how to keep them from stretching or falling apart when you transfer them to a baking sheet: Roll out the dough on parchment paper, cut the shapes, remove the scraps, and slide the whole sheet of parchment paper directly onto the baking sheet. 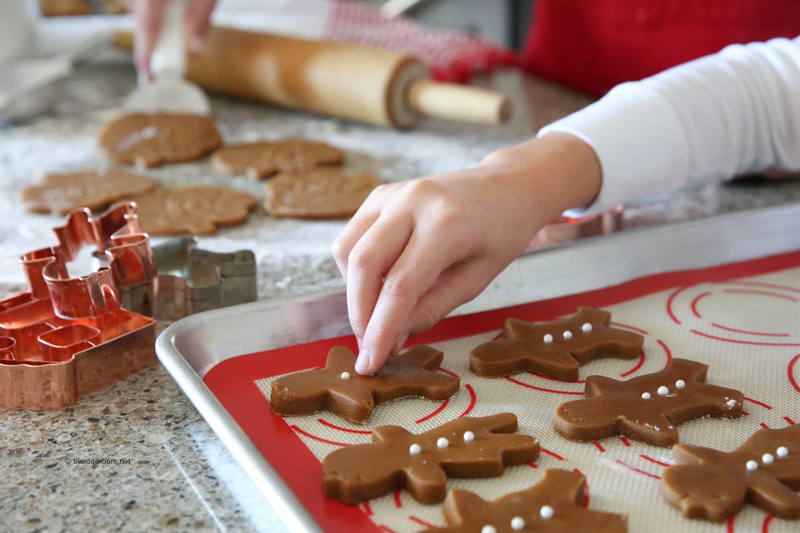 Let baked gingerbread cookies cool completely before you decorate them. A simple glaze of confectioners’ sugar and milk works well for decorating cookies. Add extracts or citrus zest to enhance the flavor. Add decorations (such as colored sugar, shredded coconut, toasted sliced almonds, chocolate and rainbow sprinkles, edible glitter, multicolored nonpareils, button candies, mini semisweet baking bits, and dried currants) before the icing dries. If you aren’t using icing you can add some decorations before baking. Let decorated cookies rest flat and uncovered for about 2 hours or until icing firms up. You can make the cookie dough and freeze it for up to three months. Baked (undecorated) cookies can be stored in the freezer for up to four weeks. Baked and decorated cookies can be stored in airtight containers for up to 2 weeks. 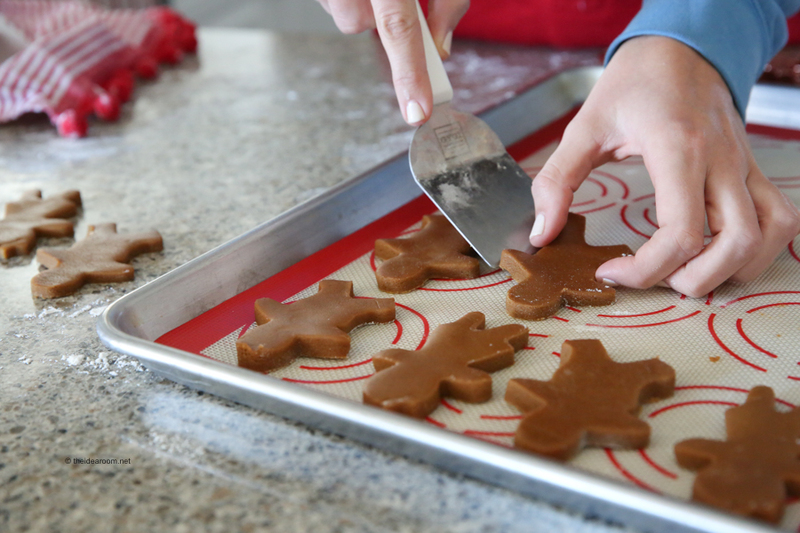 Place waxed paper between layers of your soft gingerbread cookies to prevent them from sticking to each other. In large bowl, sift together flour, ginger, cinnamon, allspice, baking soda, and salt. Set aside. In an electric mixer, cream butter and brown sugar on medium speed until fluffy, about 3 minutes. Beat in eggs one at a time and add molasses and vanilla and beat until completely mixed. Add flour. Dough should be soft (not dry or crumbly) but not sticky. If sticky, add a few tablespoons of flour until desired consistency is achieved. Divide the dough in 2, place each half on a large piece of plastic wrap and chill the dough for at least 2 hours. Remove from fridge. Place on top of a large piece of lightly floured parchment or wax paper. Roll dough out till it is about 1/4 inch thick. Slide your parchment paper and dough onto a board, then place in refrigerator for about 30 minutes, or freezer for 15 minutes (or more). Preheat the oven to 350˚F. Line two or three baking sheets with silicone mats or parchment. Remove the rolled dough from fridge, and cut your shapes using the cutters or template of choice, placing them on the prepared baking sheets. Bake until the edges just start to brown, about 8 minutes for medium cookies, and 10 minutes for larger cookies. Cool sheets on wire racks for 20 minutes, then gently remove cookies and place on wire racks to finish cooling. If cookies are too fragile, you can cool completely on trays. Decorate with royal icing, candies, sprinkles, and more. Here is our favorite soft gingerbread cookies recipe! These turn out perfectly every time. A little crisp on the outside and soft and chewy on the inside. The perfect combination of spicy and sweet! These Soft Gingerbread Cookies Are Sweet, Soft, And Lightly Spiced. This Is The Perfect Cut-Out Cookie Recipe That Won't Lose Its Shape When It Bakes. Try Our Gingerbread Cookie Recipe This Holiday Season! In an electric mixer fitted with the paddle attachment, cream butter and brown sugar on medium speed until fluffy, about 3 minutes. Beat in eggs one at a time, scraping sides of bowl between additions. Add molasses and vanilla and beat until completely incorporated. Reduce mixer speed to low and add flour mixture until thoroughly combined, about 30 seconds. Dough should be soft (not dry or crumbly) but not sticky. If sticky, add a few tablespoons of flour until desired consistency is achieved. Divide the dough in 2, place each half on a large piece of plastic wrap, press down with the palm of your hand and make a disc about 2" thick. Finish wrapping the disc with the plastic wrap. Chill the discs of dough for at least 2 hours. Remove one disc and remove plastic wrap. Place on top of a large piece of lightly floured parchment or wax paper (I use a silicone rolling mat underneath to ensure it doesn't slip while rolling, but you can even dampen counter so the parchment sticks a bit. ), then place two 1/4" wooden dowels on either side of your dough, then another sheet of parchment paper. Roll dough (this will require a bit of elbow grease for the first few minutes until it softens up a bit) so it's flush with dowels--they will ensure that your dough is even thickness. Preheat the oven to 350˚F. Line two or three baking sheets with silicone mats or parchment. Remove the rolled dough from fridge, and cut your shapes using the cutters or template of choice, placing them on the prepared baking sheets. Bake until the edges just start to brown, about 8 minutes for medium cookies, and 10 minutes for larger cookies. Be careful not to over-bake, or cookies will be dry. Collect remaining dough and re-roll once, repeating cutting and baking steps. Dough rolled out more than once will be a little tough, so it's best to keep it to a 2-time roll-out maximum. Looking for other delicious holiday baking recipes? Here are some of our favorites to make during the Christmas season! Love gingerbread cookies. A favorite. Our favorites at Christmas are cranberry orange bars and mincemeat. Thank you for sharing your recipe. Look forward to your posts. Nancy- Those sound delicious!Thanks for following along! My kids will love helping me with these!! They look so soft & delicious! 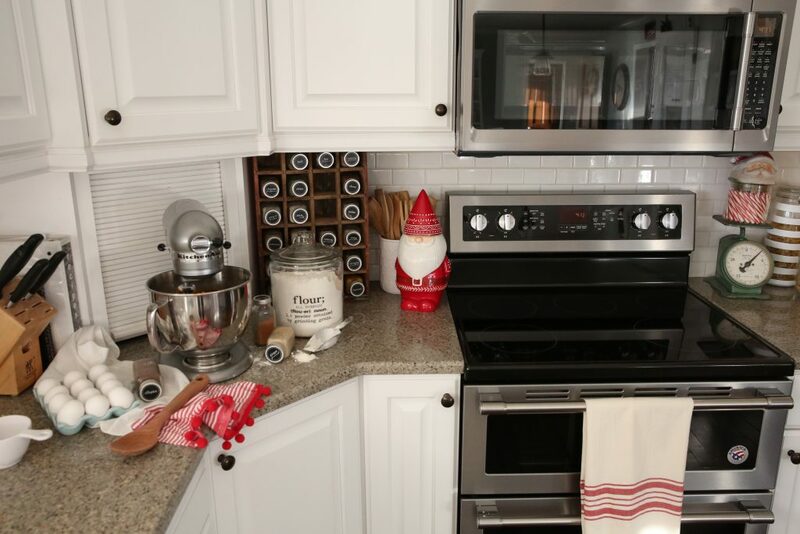 I love your flour canister and spice rack! Where did you get them? I’ve been scouring the internet and can’t fins them. Thanks! These look so yummy and I bet they smell wonderful!